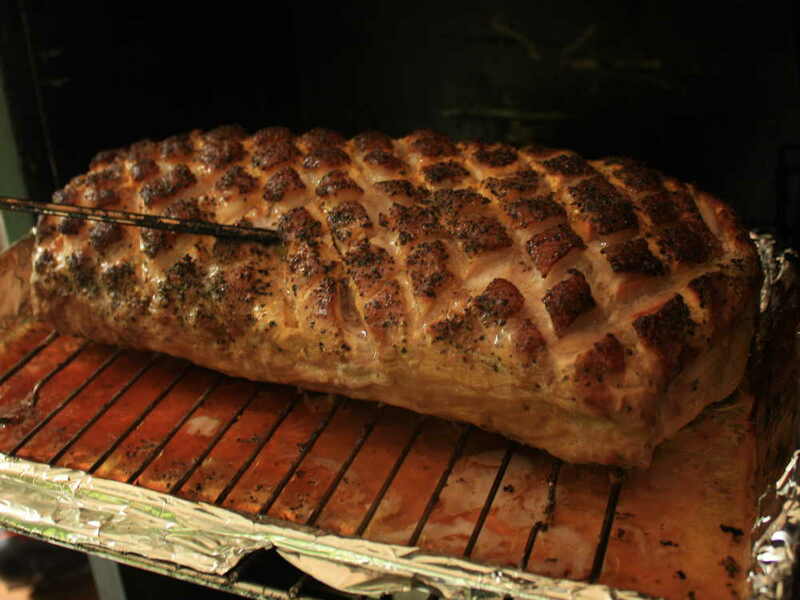 A smoked pork loin might be just the thing for you to cook for the crowds this Memorial Day. It doesn't take much effort or time to get one ready for the smoker, and compared to some other meats, a pork loin doesn't take a long time to cook. This smoked pork loin recipe is an easy one, and because of the simple seasonings used can be served with your favorite barbecue sauce. 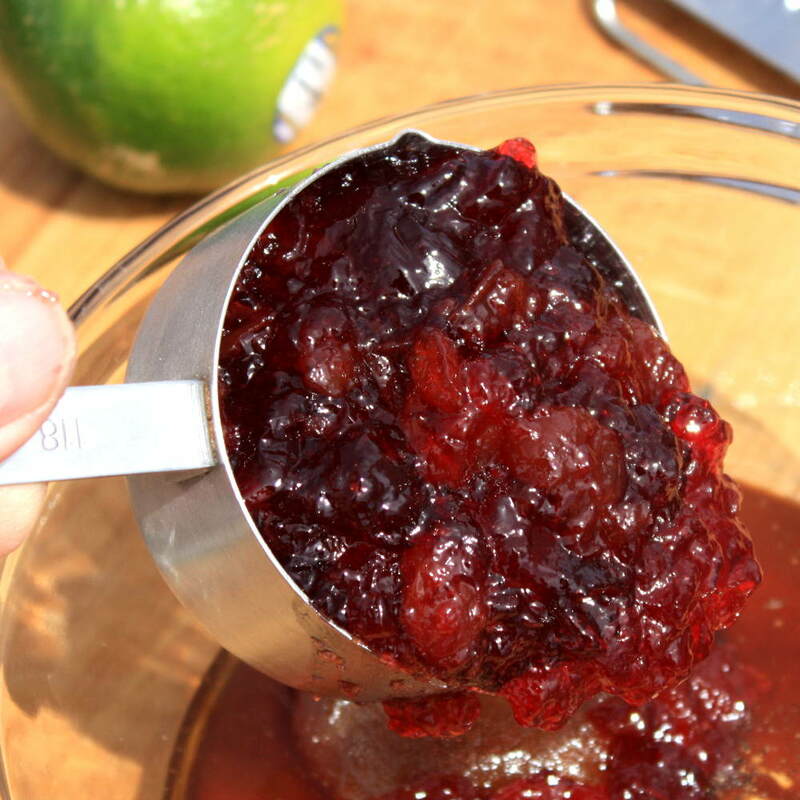 If you want to make it really special you can dress it up with a batch of Cherry Lime sauce (recipe at bottom of this page). I smoked one of these pork loins last week in my Masterbuilt electric smoker. Total time required was about 3-1/2 hours: 30 minutes to get it ready for the smoker, 2 hours, 45 minutes in the smoker (set at 275˚F), and another 15 minutes for resting and slicing. That's relatively quick for large cut of smoked meat. And it was super juicy, tender and tasted great! The following steps give you all you need to know to smoke an impressive pork loin this Memorial Day. If you're using a charcoal smoker, light the charcoal so it's white and ash covered before you start cooking the pork loin. If using an electric or gas smoker you can also preheat it before the meat goes in, but it's not necessary. When I use my electric Masterbuilt smoker, I usually don't preheat it beforehand. I turn the smoker on when the meat goes in. Doing it that way does make the cooking time a little longer, but since cooler meat absorbs more smoke, I think cold-starts give the meat a richer, smokier flavor. 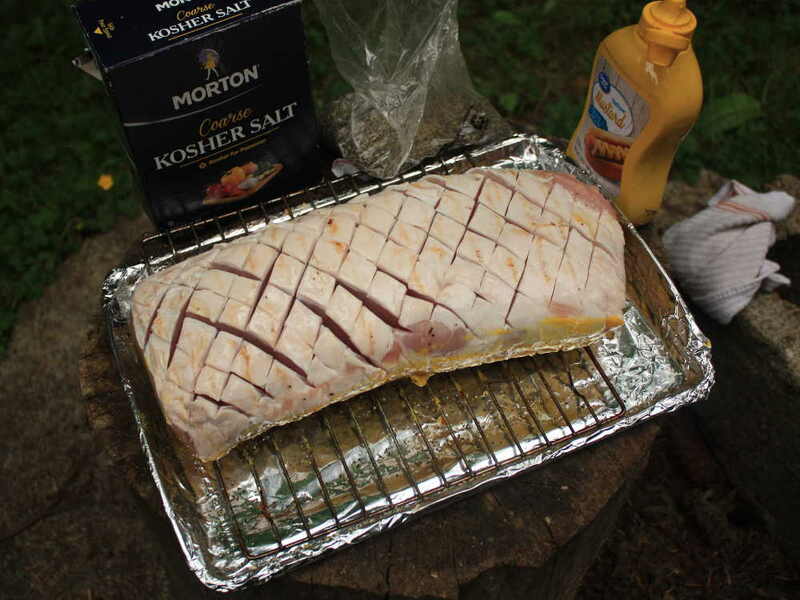 Place the pork loin on a smoker-fitting baking sheet (fat cap side down). Wrap the baking sheet with heavy duty aluminum foil first to make cleanup easier. I use a small rack that fits in the sheet pan to keep the pork up and out of the juices as it smokes. It allows smoke flavor to reach the roast's underside, and makes taking the loin out of the smoker a lot easier. Keeps the smoker cleaner, too. You don't have to use the pan-and-rack method. Just place the pork loin directly on the smoker grate if that's your preferred method. 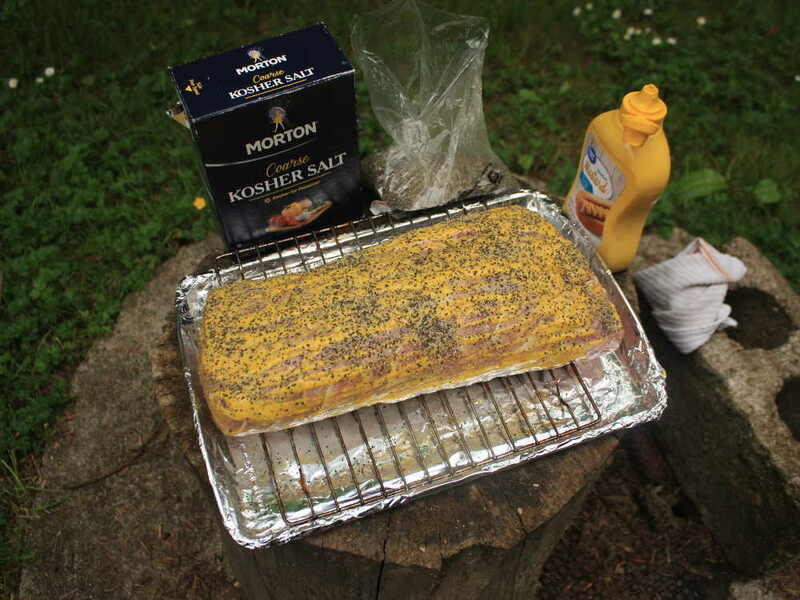 Rub half of the yellow mustard onto the pork, then season it evenly with half of the salt and pepper. Turn the pork loin so the fat cap is on top. Score through the fat in a cross-hatch pattern, cutting just deep enough to reach the meat. Doing this speeds up rendering of the fat, allows seasoning flavors to reach the meat on that side and makes the finished pork loin look great when it's done. Rub the remaining mustard onto the scored fat, and season with the rest of the salt and pepper. Place the loin (pan and rack too, if you're using them) into the smoker, fat side up. Try to keep the smoker temperature at 275˚, or as close as you can get. If your smoker temp doesn't get that high, no worries. Smoking time will be longer, and the fat won't crisp up as much, but it'll still taste good. Insert your remote thermometer probe or the smoker meat probe into the center of the loin where it's thickest. It's important to monitor the temperature of the pork loin as it cooks. If it's overcooked by even a few degrees, it can go from juicy to dry in a very short time. 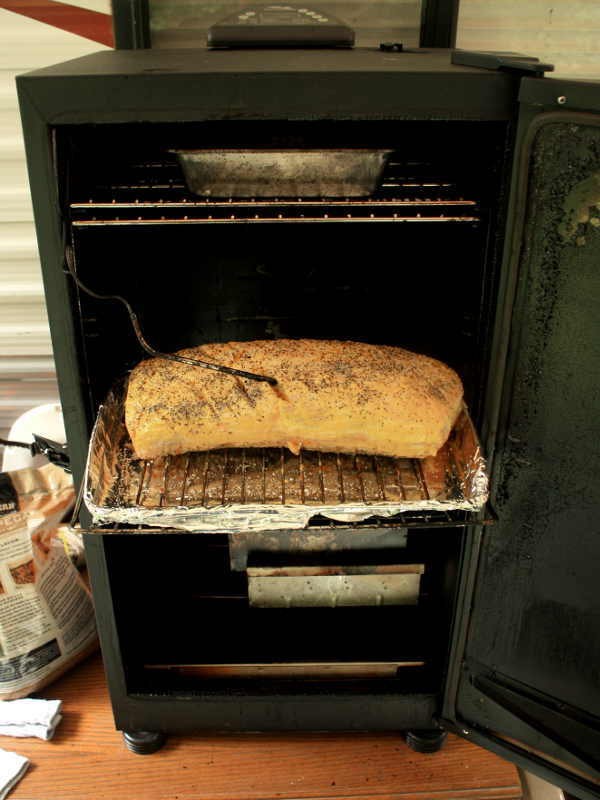 To prevent the loin from drying, add some liquid to the smoker water pan. Water alone is all it needs. Good smoker wood choices would be any of the fruit woods, like apple or cherry chips. Pecan is good too, but has a more intense flavor. I used pecan chips with my last smoked pork loin, and two 1/2 cup additions of chips provided just enough smokiness. The first addition went in when the meat went into the smoker. The second batch of chips went in 1/2 hour later. 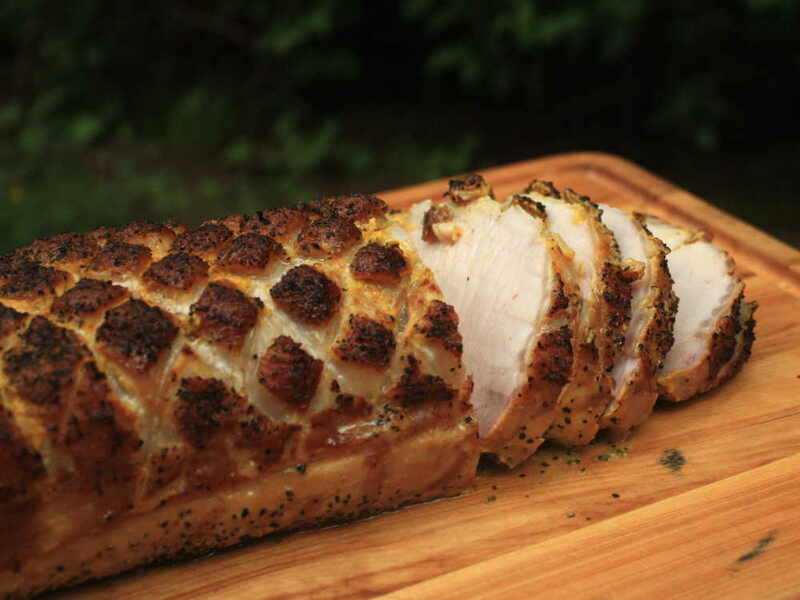 A pork loin is at its best when cooked to 145˚F. The meat is juicy, with little or no pinkness remaining. When it reaches 145˚ use a handheld instant read thermometer to check different areas. The center of most of the roast should be at 145˚, but it'll be a little warmer near the ends and closer to the surface. Overall, if your readings show temps in the 145˚-150˚ range, it's perfect. Remove the finished loin from the smoker and place on a cutting board or serving platter. Cover loosely with aluminum foil and allow it to rest for 10 minutes. Slice thinly for sandwiches, or cut it into thicker pieces to serve directly on the plate. 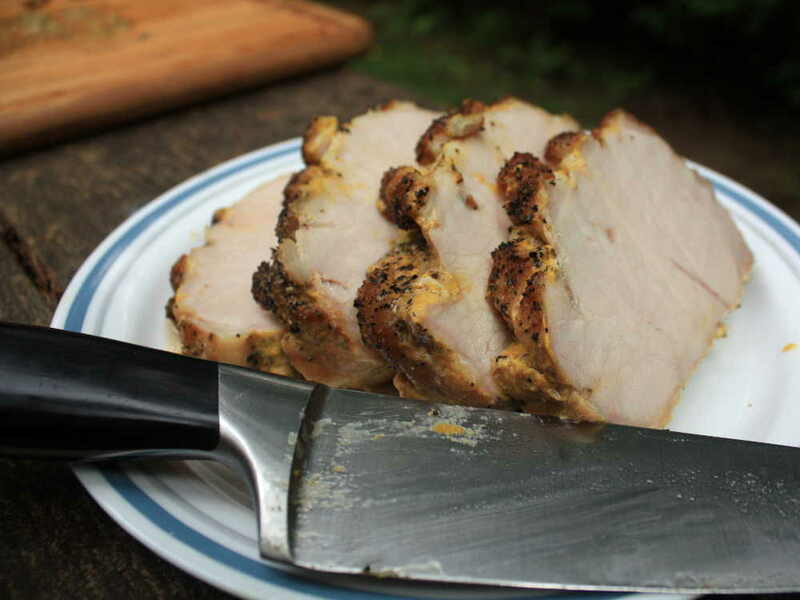 This smoked pork loin is great without sauce or can be flavored up with barbecue sauce. 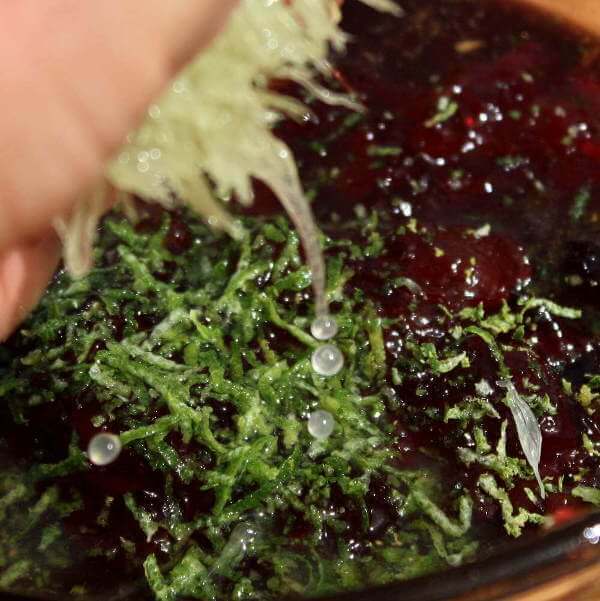 But to make it really special, give the Cherry Lime sauce/glaze recipe a try. It's easy to make and really tastes great on slices of pork loin. Pork Loin - Fat Side Up or Down? This cherry lime sauce was originally made as a glaze and table sauce for smoked ham, but I've found that it goes well with smoked pork loin too. Incredibly well! Combine ingredients in a mixing bowl and it's ready to use. This sauce/glaze recipe adds great flavor to slices of smoked pork loin. In addition, you can brush a couple of coatings of the glaze onto the smoking pork loin during the last half hour or so of cooking. It flavors the surface of the loin and gives it a nice color. Regularly priced at $99.00, the Smoke is now on sale for only $84.99. A great deal on a great, easy to use dual-probe smoker thermometer. Now available in 9 sharp colors!